of their “snow fort” taken. coat, and camera and went out and took a pic. gotta love those little buggers. and today there is no snow day. >Very cute…Now, I have NO idea who the Colts are… but very cute! 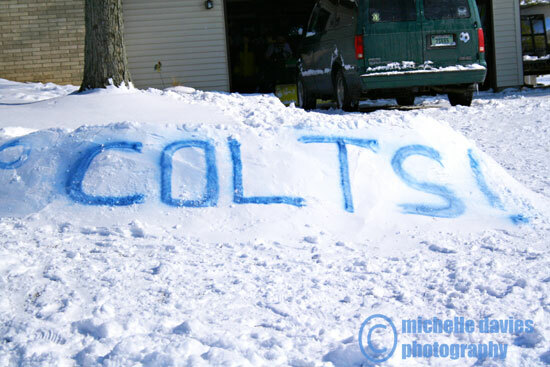 >Go Colts, very fun photo! Great idea. >My daughter is only 3, but she’s cheering for the colts too, just because her name is Peyton! LOL She thinks it’s so cool to hear her name on T.V. >Lots of fun!! what a great idea!! >This is great! Very cute idea. I’m a Chiefs fan so I’m rooting for both teams. >Very nice. Love this. Reminds me of when people write the names in the sand with the year when they go to the beach. I can’t wait to do this when it snows to get a picture of Natalie with the year in the snow. SO FUN!